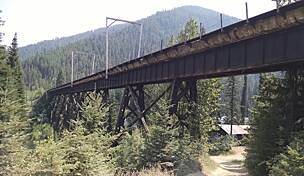 Surrounded by the splendor of western Montana’s Rocky Mountains, the Great Northern Historical Trail extends 22 miles between the lakeside town of Somers and the mountain valley community of Kila. 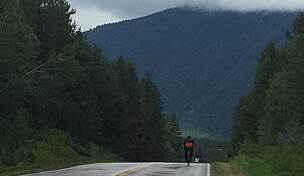 This paved path follows part of the route of the former Great Northern Railway, wandering through Montana's Flathead Valley and offering unmatched views of the surrounding mountains, including the Swan, Mission, Salish and Whitefish ranges. We offer several recommendations for overnight accommodation, though suggest exploring the Kalispell Visitor Bureau’s website for a thorough listing of the region’s offerings. 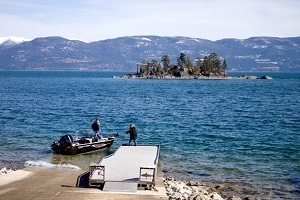 The southeastern terminus of the Great Northern Historical Trail (GNHT) is in Somers, a small community on the northern shore of Flathead Lake. Outlook Inn B&B and Somers Bay Log Cabins are conveniently located just off the trail and near the lake. Additionally, public campgrounds are scattered about the lake’s entire shoreline; the two closest to Somers are at West Shore and Wayfarers State Park; both are about an 11-mile drive and provide tent and RV campsites. 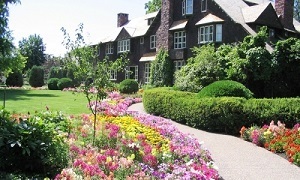 There are numerous hotels in Kalispell as well, from the modern to the historical. Established originally as a rail town in the late 1800s, Kalispell is located 10 miles north of Somers and is home to the Historic Kalispell Grand Hotel, which has been keeping an eye on the comings and goings of the town’s denizens since 1912. You’ll also find Wheaton’s Cycles ready to provide you with bike rentals or repair services. Travelers can fly into the region via the Glacier Park International Airport (9 miles northeast of Kalispell) or come by train to the Amtrak Station in Whitefish (26 miles north of Kalispell). 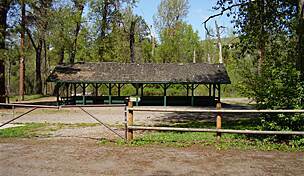 There are no water fountains or restroom facilities on the Great Northern Trail and, unless you opt to take the off-trail detour into Kalispell, few community amenities along the route. Bring plenty of water and snacks with you for the entire ride. Begin the inverted V-shaped Great Northern Historical Trail at its southeastern end in Somers, once a major port, mill town and tie yard. 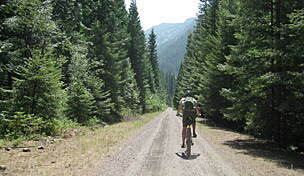 If you are staying at the local B&B or log cabin, just hop on your bike and head the very short distance to the lake. Otherwise, park your car at the pullout along the lake across from Sunnyside Avenue on Highway 93. 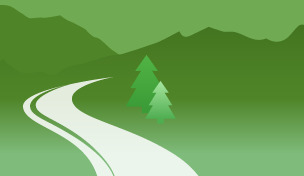 The trail parallels Highway 93 north for 0.5 miles. Turn right onto Somers Road for a quick off-trail interval. Stop at Somers Bay Café for a hearty breakfast or lunch and enjoy the historical photos and artifacts displayed on the café’s walls (or stay on Highway 93 for a caffeine detour at Sudden Rush Espresso). Not far beyond the café, across from the post office, the trail resumes to your left. There is a small parking area here as well. 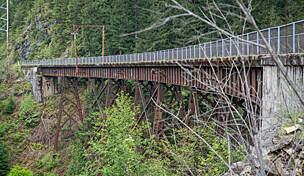 This 22-mile trail only partially follows the old rail bed. The original line, built during the late 1800s to early 1900s, ran between Saint Paul, Minnesota, and Seattle, Washington, and was the northernmost transcontinental rail in the country. Somers was initially established as a company town for the Somers Lumber Company, a mill financed by the Great Northern Railway to produce hundreds of thousands of railroad ties from the larch, pine and fir forests surrounding Flathead Lake. 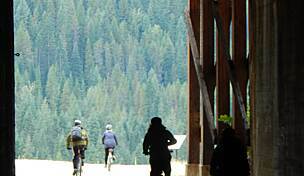 Leaving the largest natural freshwater lake west of the Continental Divide, the trail heads north toward Kalispell through a landscape of cultivated fields, pasture and light industrial storehouses. On a clear day you may see the mountains of Glacier National Park in the distance to the northeast. The Great Northern Railway’s iconic logo of the mountain goat standing on a rock is symbolic of the Rocky Mountains that outline the distant vistas around you. The GNHT parallels US 93 for 6 miles before going underneath it at the creek crossing and taking a more westerly tack. 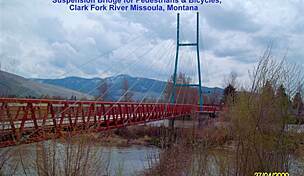 It keeps to the west of Kalispell, the county seat and the largest city in Montana’s northwest. If you want to head into downtown, turn east off the trail at Sunnyside Drive (mile 9.5) and take it to the bend north, where it turns into 5th Avenue W. Follow 5th Avenue to 11th Street and turn right (east), taking it 9 blocks to Main Street (US 93 Bus). There are plenty of eateries and historical points of interest in the vicinity of Kalispell’s Main Street. Enjoy a tasty lunch of Italian and Mediterranean cuisine at Bonelli’s Bistro, some homemade treats at Sweet Peaks Ice Cream, or local ale from the Kalispell Brewing Company. The nearby Hockaday Museum of Art (open Tuesday through Saturday) houses permanent and traveling exhibitions featuring current and past visions of the American West, and the Conrad Mansion Museum is a preserved pre-1900 home complete with original family furnishings. 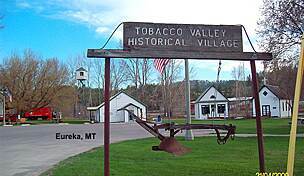 The Montana Historical Society has produced a walking tour brochure that highlights both of these museums as well as many more historical sites in the downtown area. While in Kalispell, make sure to replenish your water supplies. Back on the main trail, continue heading in a northwesterly direction. The trail again parallels the US 93 bypass then crosses another creek. The branch heading to the right goes a short distance farther to dead-end at a government building just north of US 2. The left branch goes under US 93 and continues to Kila. 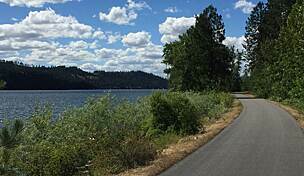 The trail parallels US 2 through scattered homes sites and fields and past a small waterfowl reserve. You're already on the downward leg of the inverted V and nearing trail's end at Kila and Smith Lake, another waterfowl reserve. From here, enjoy the mountain scenery before heading back to Somers or the lake for some fishing. If you have arranged for a shuttle pick-up at the trail’s end, look for the small parking area at the intersection of Kila Road and Smith Lake Road. If you plan to ride this trail, chances are that this is but one of many recreational activities on the agenda for your visit. The majestic Glacier National Park lies to the northeast, the stunning Flathead Lake to the south, and Big Mountain and the resort town of Whitefish to the northwest. As you can imagine, recreational opportunities are abundant and your second day in the area can easily be filled with swimming, boating, fishing, hiking, backpacking and biking.